Chris and Rachel from Capital Ale House recently visited Sierra Nevada Brewing in Chico, CA to take part in a "beer camp." While there they helped to brew I.D.E.A. - India Dark Elusive Ale. This limited beer was tapped Tuesday evening at all Capital Ale House locations as part of the weekly "Steal the Glass" night. I went down to CAH with two good friends so we could try out this one-of-a-kind beer. I.D.E.A. pours a dark brown with a thin beige head. The aroma is roasted malt with a hint of citrus. The taste is roasted malt with some sweetness to balance. A lingering bitterness remains in the dry finish. Overall, I enjoyed this beer, as did others. Admittedly, I was looking forward more citrus hop flavors based on the pre-release notes on the beer. Despite that, it was certainly a pleasure to be able to try out this very limited beer. In addition to I.D.E.A., I treated myself to a draft of Tröegs Nugget Nectar. I only managed to pick up a few bottles of this favorite this year, so I was pleased that Capital Ale House still had it on tap. BTW, there was some confusion on the part of the staff as to which Sierra Nevada glassware was to be used for the I.D.E.A., which explains the Summerfest glass shown at the left. After questioning, the bartender graciously swapped our shaker pints for the much nicer etched Sierra Nevada glass shown here. The next "Steal the Glass" night will be June 9 featuring Boulder Beer. So what was your thoughts on this beer? 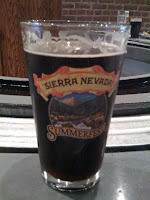 Did you try any other Sierra Nevada beers? I did not try any other SN beers that evening. The IDEA was a fine porter-ish drink. From the description, I was expecting the hops to be more prominent. There was nothing wrong with IDEA; I certainly wouldn't turn one down, it just wasn't an exceptional beer. None the less, the opportunity to try any new beer, especially when you know the brewer, is always welcome and fun.